Reliable Fire & Security provides first aid kits to help you deal with typical workplace accidents. Our kits come completely stocked and ready to use. 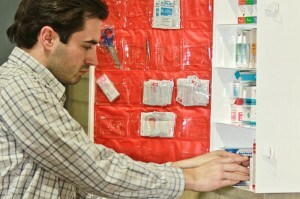 Many businesses also receive reduced insurance rates for providing first aid kits. We carry many items that can be added or substituted to meet your specific needs. Speak to a professional at Reliable today for your first aid needs. We will work with you to develop a safety program through proper product selection, regular site visits, CPR instruction, and first aid training. We offer pre-stocked cabinets as well as units that can be customized in a variety of sizes to support single office settings to large manufacturing facilities.